Nan A. Talese, 9780385524476, 320pp. At the heart of Union Atlantic lies a test of wills between a young banker, Doug Fanning, and a retired schoolteacher, Charlotte Graves, whose two dogs have begun to speak to her. When Doug builds an ostentatious mansion on land that Charlotte's grandfather donated to the town of Finden, Massachusetts, she determines to oust him in court. As a senior manager of Union Atlantic bank, a major financial conglomerate, Doug is embroiled in the company's struggle to remain afloat. It is Charlotte's brother, Henry Graves, the president of the New York Federal Reserve, who must keep a watchful eye on Union Atlantic and the entire financial system. Drawn into Doug and Charlotte's intensifying conflict is Nate Fuller, a troubled high-school senior who unwittingly stirs powerful emotions in each of them. 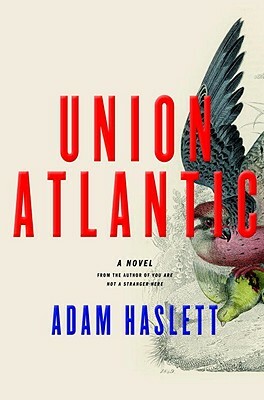 Irresistibly complex, imaginative, and witty, Union Atlantic is a singular work of fiction that is sure to be read and reread long after it causes a sensation this spring. "Adam Haslett . . . may be our F. Scott Fitzgerald, an author capable of memorializing our crash in all its personal cost and lurid beauty. Hist first novel, Union Atlantic, is a strange, elegant story that illuminates the financial and moral calamity of the young 21st century. . . [A] profound, strikingly intelligent story about the cost of living in a world in which real values have been supplanted by a fiat currency of self-interest and empty promises." "An ambitious literary work, filled with compelling characters, evocative prose and finely drawn portraiture. . . Union Atlantic is the first serious fictional portrait of the bailout era. . . Decades from now, this fine novel will help readers understand the period we've just been through." "The first great novel of the new century. It's big and ambitious, like novels used to be. It's about us, now. All of us." "Union Atlantic is an indispensable book of the new century, because no book has nailed the new century so squarely." "Adam Haslett's page-turner of a debut novel ranges brilliantly from the Strait of Hormuz to the outskirts of Boston to the belly of the financial beast—New York's Federal Reserve. It explains to me, with humor and style and generosity, how we became America in the year 2009. A must read." "This is the rare novel that is both urgently of its time and fully true to itself. Adam Haslett saw it all coming: our particular moment, our particular crisis. And because he was so far ahead of our leaders and our opinion-makers—because he's a true writer—he could take the time to fashion a book of exceptional maturity, completeness, compassion, comedy, and suspense." "[A] rare novel—an honest, unflinching statement that rouses our passions and challenges our intellect." "Excellent. . . Haslett's novel is smart and carefully constructed, and his characters are brilliantly flawed. . . This book should be of interest to readers fascinated but perplexed by the current financial crisis, as it is able to navigate the oubliette of Wall Street trading to create searing and intimate drama."